Greenhithe - signs of improvement. This place, one of the prettiest villages in Kent, with splendid views and walks, and from which her Majesty recently took her departure for the Continent, shows undoubted signs of progress. There are scarcely any apartments to be had, and a number of detached houses are in great request, at rentals of about £70 per annum. There is therefore a fine opening for builders. This is the only spot in the Thames for whitebait, and the attractiveness of the locality is much increased by the seat of C. Umfreville, Esq., called Ingress Abbey, and surrounded by one of the most beautiful parks in the county. "Shrimps all alive, oh!" a cry that resounds at every seaside place, and also through the romantic streets of Gravesend and the borough is, unfortunately, a "stretcher". These shrimps are already boiled. 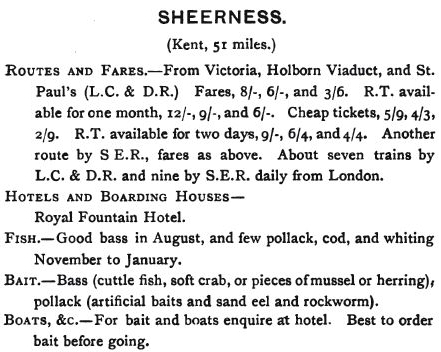 In the Thames estuary professional sea fishing is carried on for shrimps, whiting, flat fish and lampern up to St. Clement's Reach, but there is not much done above Lower Hope at Gravesend. From most of the jetties where the water is brackish a few flat fish and eels can be caught. It would seem, indeed, that the good old times when fish abounded were about to return, for the professional fishermen - who are not a class ready to admit any improvement in the fisheries - one and all declare that there is a marked improvement in the quantity and size of the fish caught in the mouth of the Thames, and that not only are fish more numerous, but that they are found higher up the river than has been the case for many years. This welcome improvement is, of course, owing to the increased purity of the water brought about by the action of the London County Council. Mud, marl and sandy flats are the general characteristics of the river; here and there, particularly near Southend and Leigh, flat fish are very abundant, and are much sought after by anglers. Whitstable. Mr. G.R. Clarke sends me a note on the fishing at this place, which one is more apt to associate with the lately ostracised oyster. The fish, he says, are mainly flat-fish (soles, dabs and plaice, the last-named up to 2lb) and "silver" eels, the bait most used being lugworm. Prince's Channel, 11 miles run from the Nore, seems to be one of the principal waters and Thomas Knight (charge, 6s. per day) of 45 Albert Street, is recommended as fisherman. … South East Side. WHITSTABLE STREET. On the eastern side of the approach to the East Swale, this narrow ridge of pebbles, usually dry, extends about ¾ of a mile northward from the coast close eastward of Whitstable town. From its drying extreme the outer edge of the one fathom line is a mile further out, the Whitstable Street buoy being moored just outside it. WHITSTABLE FLATS. 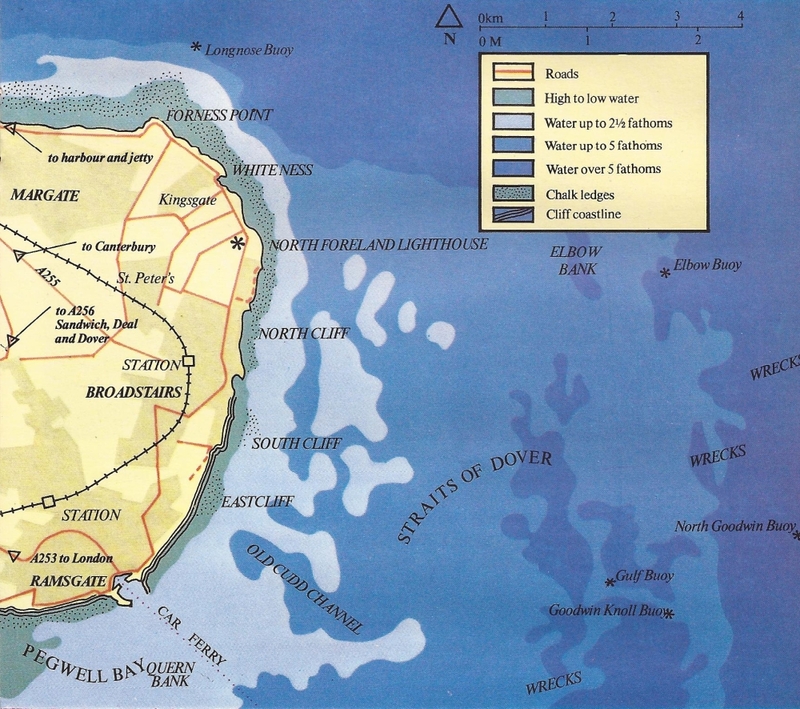 These extensive flats, drying from one to 3 feet, and extending off the coast westward of Whitstable towards Shell ness, contract the Swale opposite that point to less than a quarter of a mile, and thence form the south-east side of the channel as far as Faversham creek. Abreast of Shell ness, Pollard Spit, of hard sand and shells, dries two feet, and projects as a tongue about three-quarters of a mile further northward of the flats. Tides. High Water: -1 hour 19 minutes H.W. London Bridge. Rise: 17¾ft at Springs; 14½ft at Neaps. Tidal Streams: The direction and strength of tidal streams around the Isle of Sheppey are extremely variable, and considerable turbulence may be encountered in places where the wind is blowing strongly against the tide. In the Medway channel forming Sheerness harbour the tides run hard. The flood begins -6 hours local H.W. and attains a rate of 2½ knots at Springs. The ebb begins +20 minutes local H.W. and attains a maximum rate of 3 knots at Springs. The streams in the Swale channel can be very strong at times (up to 4 knots at Springs near Kingsferry, and 3 knots near Elmley). The current is slack along the whole channel from about -5 hours 55 minutes to -5 hours 25 minutes local H.W. Then the tide begins to run in from both ends of the channel, picking up strength very quickly, but decreasing again to some extent as the mudflats become covered. At 0 hours 5 minutes local H.W. the stream begins to run into the Swale from the Medway end only, flowing right round the south side of the island. This continues until +1 hour 5 minutes local H.W. after which the tide begins to flow outwards from both ends of the channel until -5 hours 55 minutes local H.W. when the slack water period previously mentioned occurs again. Note. Weather conditions and other factors are liable to affect the forgoing times, and they should only be regarded as a rough guide. Topography. The Isle of Sheppey is low-lying and bounded in many places by extensive mudflats. However, on the east side, near Leysdown, the foreshore is sandy, and there are some cliffs towards Warden Point. Sheerness, the main town on the island, and a Naval dockyard, is situated at the mouth of the river Medway where it joins the Thames estuary. General Remarks. As Sheppey is a fairly small island, the fishing is reasonably constant so far as species are concerned, both along the north shore and the south shore (Swale saltings). Almost any of the beaches can produce fish when the tide has covered the flats, but swimmers and boat traffic restrict the fishable areas during the summer months. In particular, fishing in the Rifle Range and Minster Cliff areas is badly hampered during good weather by sailing and power boat enthusiasts who hug the shore in order to show off - a menace to anglers and swimmers alike. 1. Garrison Beaches. A useful fishing area. Dabs and flounders are encountered for most of the year; also eels, bass, thornback rays, garfish, dogfish, pouting, soles and small conger in summer and autumn. During the latter part of the year whiting and codling come in. The beaches are mainly flat with a few rocks, yielding ragworm at L.W. and soft and peeler crabs in season. Certain parts around the Point can be fished at all states of the tide. 2. Mile Town Beaches. Flounders are taken for most of the year, with eels, bass and a few garfish during the summer. This area is not fished very much. The beaches are flat, with a few rocks. Bait in this area is in short supply - Jacobs Bank being over-dug. 3. Marine Town Beaches. Flounders and a few dabs are taken for most of the year, whilst eels, bass, thornback rays and the occasional sting ray are caught during the summer. Soles, too, may be caught in the evening, mainly at dusk. Whiting and codling during the winter. This shore is very flat, with a good ragworm bank at spring tide. Also a few soft and peeler crabs in season, and slipper limpets. 4. Cheyney Beaches. Flounders, dabs and a few plaice are encountered for most of the year, with eels, pouting and soles during summer and autumn. Whiting show up during late autumn, followed by codling during the winter. The shore consists of mud and sand flats, with a line of rocks at the bottom of the beach. Good ragworm can be dug at spring tides, but the ground is easily over-dug. Peeler and soft crabs during season. 5. Rifle Range Beaches. Flounders are encountered for most of the year, with eels, dabs, bass, sole and thornback rays during summer and autumn. Whiting and codling during late autumn and winter. The shore is stone and shingle, with muddy sand flats giving large black and red lugworms; also cockles and a few clams and razorfish. There are also one or two banks of mud and shingle full of small ragworm, but they are too soft to dig. 6. Minster and Warden Beaches. Good flounders are taken here during the spring, together with a few dabs. The summer months are good for eels, bass, flounders, dabs, thornback rays, sole, pouting and garfish. Good sport has been had at dusk on a summer's evening spinning for bass and garfish. Whiting and cod during winter months. The beach is mainly narrow, and the sea washes the cliffs at H.W. in most areas. There are, however, sandy mudflats yielding good red and black lugworms; also a few clams and razorfish. 7. Leysdown Beaches. Best fished during winter and early spring before they become crowded with holidaymakers. Good flounders are taken here during the winter months but we have no record of anyone catching either whiting or codling. Summer produces eels, dabs, bass and thornback rays. The beaches are of fine sand. Lug can be dug, but they have to be searched for. Cockles are plentiful. 8. Swale - from Harty to Queenborough. Fishes well for flounders for most of the year, and for eels, bass and mullet during the summer. Soles, garfish and pouting are also taken. The shore, consisting of mud banks and soft mudflats, can be dangerous at very low tide, owing to the deep boat channel. 9. West Minster to Garrison Point. A good area for flounders during the winter months; also dabs, bass, eels, mullet, pouting, thornback rays, sting rays, garfish, mackerel and herring during the summer season. This area contains virtually no beaches, and it is very rocky against the waterfront walls. The mud hereabouts is very soft and dangerous. Note. Sheerness Pier and Harbour (Old Sheerness Dockyard) are private property and fishing is not allowed. Fishing is prohibited in the mouth of the Medway, which is a main shipping channel. 10. Garrison Point to Boom. Spring fishing is rather slow, yielding mainly flounders with a few dabs inshore. In late spring and summer the fishing improves, with eels, bass, garfish, dogfish, pouting, sole (evening), mackerel and herring in season. Whiting and codling during the autumn and winter. 11. Boom to Shellness. Not fished much during the early part of the year, apart from flounders. During summer, however, the boom area is very good for all fish, and particularly for bass during the evening and night. Thornback rays are taken at both deep and shallow marks, and large tope may be caught off the boom at deep water marks. The winter months are good for whiting and cod. Conger have been caught alongside the beach during summer evenings. 12. Shellness to Saltings (Swale). Very good flounder fishing all the year round. The middle of the year is good for eels, bass, mullet, garfish, sole; also whiting during the winter months. Ragworms (R) may be dug at Garrison, Marine Town and Cheyney beaches and between the rocks in the West Minster/Garrison Point area. Lugworms (L) can be dug at Rifle Range, Minster and Warden beaches; also at Leysdown, but this beach is not so productive. Peeler and soft crabs (C) may be found during the summer months at Garrison, Marine Town and Cheyney beaches. Cockles (K) are present on Rifle Range and Leysdown beaches. Clams (CL) are found in limted numbers on Rifle Range and Minster beaches. Slipper Limpets (SL). Marine Town beach. Sports Centre, High Street, Sheerness. Isle of Sheppey Angling Association. Hon. Secretary: Mr. F. Ginger, 4 Alma Road, Sheerness. 1 Garrison Point: Very rocky with fierce tides. Some good bass fishing, especially for big ones. Good silver eels, dabs, scad, flounders and thick-lipped mullet in summer. Cod and whiting, in some years as far upstream as Gravesend, in winter. The pier is owned by the Medway Ports Authority and fishing there is restricted. Bait supplies are uncertain and hard to gather, so visitors are advised to contact Sheppey Bait and Tackle Shop, Neptune Terrace, Sheerness (Tel: Sheerness (07956) 3665). 2 Barton's Point: Consistent for bass and eels in summer, though better in winter for cod and flatfish. Boat anglers are advised that there exists a no-go area around the buoyed wreck of the Richard Montgomery just offshore. Beware of large tankers and other commercial traffic that use the sea lanes. They cannot stop for small boats. 3 Eastchurch Gap: Some cliff here. Best results are achieved casting out a bit and at night for bass, eels and smooth hounds on crab in summer, cod and whiting in winter. This area is hard to get to and you risk being cut off by the tide, so survey the place carefully in daylight before starting to fish. 4 Leysdown: The fishing can be excellent, but shallow water limits operations to 2½ hours each side of high water. Note that the private nudist beach at Shellness is accessible for neither fishing nor bait gathering. 5 Medway Estuary: This is the best area for flounder fishing using red river ragworm, especially when the fish are migrating early in the year. Plenty of silver eels and some school bass, especially at Stangate Creek. All West Minster and Queenborough walls are fishable. Boats can be chartered either through Sheppey Bait and Tackle, or through Stan Smith, High Street, Queenborough, Isle of Sheppey (Tel: Sheerness (07956) 67304). 6 The Swale: Eels, flounders and school bass in summer, a few whiting in winter and the occasional cod. Like the Medway Estuary, the Swale is heavily populated by thick-lipped mullet in summer, for which specialist study and tackle are required. 7 Tankerton Bay and Whitstable Street: Good bass and flounders off Street on peeler crab all through tide, with flatfish and eels along the beach. Some cod and whiting in winter. Charter boats operate from Whitstable Harbour. Details of bookings from Ron Edwards at 50 High Street, Herne Bay (Tel: Herne Bay (02273) 2517). High tides, especially those backed by easterlies, bring some bass in summer and cod and flounders in winter. Northfleet Creek produces flounders, with some summer mullet. Worm and tackle available locally. Best local marks are foreshore from Greenhithe to Gravesend, Sea School and Cooling beaches. A local speciality bait for codling, whiting and flatfish is cooked shrimp. Best boat marks are Grain Edge and All Hallows. Good fishing here and at Warden Point and Leysdown-on-Sea for summer bass and mullet, flatfish, rays, dogfish and silver eels, and winter codling and whiting. Eel and flounders in the Swale, with some bass. Good tope grounds off the island. Bait and tackle available locally. It could be argued that Gravesend is the nearest shore angling venue to London, which is probably why it gets a lot of attention from fishermen. Sited on the south shore of the Thames estuary, Tilbury is on the opposite Essex bank, about a mile across the river. Catches are limited to flounders and eels with the occasional bass or mullet in summer and cod, whiting and flounders in winter. Shore angling in this area is hampered by muddy banks and, after rain, these banks can be treacherous. Easy access and comfortable fishing can be found at Greenhithe promenade and Gravesend promenade, although catches are limited to eels and flounders. This area is especially noted as being ideal and safe for both junior and disable anglers. During winter the stretch of shoreline adjacent to the Gravesend Sea School  is popular because there is the chance of a 15lb cod. This length of shoreline stretches two miles to Shornemead Fort  and the Shorne Light  and a top mark is the Black Post  half-way along the venue. The "Black Post" fishing mark is located beside a stile on the bank between Shornemead Fort and Shornemead Lighthouse. Fishing is best over the high water with spring tides best. The ebb is particularly strong and a grip lead is required to hold bottom. Top baits throughout the Sea School stretch are lugworm, peeler crab and king and harbour ragworm, with boiled shrimp a local favourite for the flounders. The banks of the river are protected by a rocky wall which stretches out some 50 feet - a trap for grip leads if you don't reel in fast enough. The Isle of Grain is a flounder angler's paradise, with lots of inlets and creeks in which to drop a ragworm or peeler crab bait. It is a comparatively shallow area and winter results show only the very occasional cod. Marks at Higham Marshes , Allhallows , Yantlet Creek  and The Flats  down to Hoo , on the Medway estuary, all offer flounders. Best results come at high water: beware of the mud. Access is via the A228 from Rochester, and the B2001 to Grain. There's lots of potential around the Isle of Sheppey, where shore catches have included thornback ray, smoothhounds and stingray. Even tope have been caught in the past. Nowadays, though, it enjoys only a shadow of its former glory, and sport majors on flounders and eels. When the sun shines in June or July and temperatures rise there's the chance of bass, smoothhound and thornback being taken from Eastchurch Gap, Warden Point or Leysdown on peeler crab. For the remainder of the year the good old flounder can be found all around the island, with the West Minster Wall, Swale estuary at Kingsferry, Rushenden Bay and Queenborough amongst the favourite marks. During the spring, peeler crab, which is found all around the island, is the only bait worth using and this secures the odd decent bass as well as as the flounders and eels. A favourite bass mark is Garrison Point, on the north-west tip of the island, at the entrance to the River Medway. Strong tides make this mark difficult to fish, but it offers a chance of big bass, especially at night during midsummer. Sheppey's front beaches offer whiting and codling in winter during spring tides with Barton Point and the new promenade at East End top marks. Best baits are common or yellowtail lugworm, king and white ragworm and peeler crab. Ideal conditions of a northerly onshore wind may offer much, but the island never guarantess anything. Anglers are warned that the cliffs in the area around Warden Point are especially dangerous in wet weather and always likely to subside. 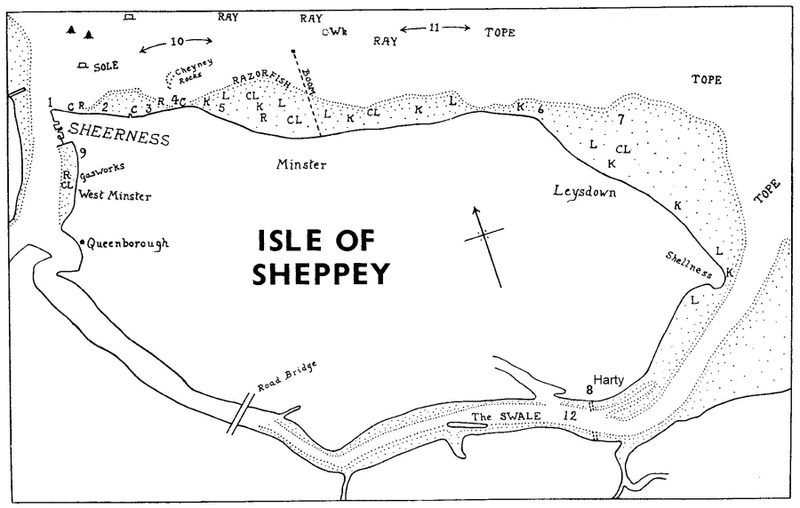 The Isle of Sheppey can be reached via the M2 (take the A249 at junction 5). A prolific River Thames summer venue that produces in the coloured water, day or night. Easy access at Denton Wharf, try between the short jetties. Lug, maddies and ragworms are the baits. Fish show at Greenhithe and in the River Medway at Strood and Rochester. Because of its shallow grounds and surf beaches, Sheppey can always produce some superb bass fishing no matter what your preferred tactics are. At the Garrison at Sheerness (when the water is clear) if you fish tight or even climb onto the rocks you can have some great fun spinning for these aggressive feeders. Frozen sand eel, sea bars and any form of plugs work well from June to September and you will also catch garfish at this venue. If you prefer to fish from the beach, then anywhere from the edge of the rocks to the wall will produce bass. From July until September you will also catch sole and eels from this mark; other species you can expect to catch are wrasse, flounders, pouting and rockling. In the winter months you can also catch bass along with codling, whiting and dogfish. These are two points between a small 400-yard shallow bay. In winter you will catch bass, whiting and cod on the night tides and when the weather is rough you will catch them on the day tides along with flounders and the odd sole. This is located alongside the Sheppey Sailing Club; although the pier has long gone it still retains the name amongst the angling community. This can be a very productive mark throughout the year depending on the weather conditions. From spring to autumn you can catch eels, bass, flounders, sole, and skate along with the odd mullet. In the winter this venue will yield catches of cod, whiting, dogfish and dabs. This is opposite the Ship-on-Shore public house, a very popular mark amongst the locals. In recent years sea defence works have been carried out at this venue so when you fish here after dark it can become quite difficult to cross the rocks. The species that can be caught are codling, whiting, dabs, pouting, dogfish, bass, flounders, sole and rockling over the winter and, in the summer months, you can catch skate, flounders, bass, eels, mullet, sole, dogfish and the odd smooth-hound. This is one of the most well known angling marks on Sheppey and is located between Sheerness and Minster. At this very popular and productive venue you will catch a variety of different species throughout the year. In the winter months you will catch whiting, cod, dogfish, bass, sole, flounder, rockling, place and pouting. In the summer months you will catch bass, eels, skate, sole, flounders, place, garfish and the odd smooth-hound. This is a venue the locals call the 'Shingle Bank'. It a great place to fish after dark, especially in the winter months when you will catch whiting, cod, dogfish, bass, sole, flounder, rockling, place and pouting. All the way along this venue you will catch flounders, bass, eels and the odd skate in the summer months and in the winter expect to catch cod, whiting, flounders, dabs, dogfish, sole and pouting. All the way along this venue you will catch flounders, bass, eels, skate and the odd smooth-hound in the summer months, and in the winter expect to catch cod, whiting, flounders, dabs, dogfish, sole and pouting. One of the most productive marks for catching flounders on Sheppey from September through to April is the Swale from Crundels Wharf to the 'Stumps'. However, this venue is rarely fished during the summer months, but those who do usually catch eels and the odd mullet. This fast-water mark is ideal for bass fishing and the best time to target them is on the last of the ebb over the slack water and the first two hours of the flood tide. This is also a great place for those anglers who like to spin or fish with plugs. It can be a bit of a stroll from the old Kingsferry Bridge to the Elmley Nature Reserve but the results can be well worth it. This is the place to catch the summer mullet that shoal up in their hundreds in the tributaries and over the shallow ground. Other species to be caught hear are flounders, eels and bass. Skate start to show early on in March and always show at Eastchurch Gap first. Then, within a week or two, they can be caught from Warden Point, the ramp at Warden and the green car park at Leysdown. The best conditions to catch skate always seem to be overcast with an onshore breeze. The best baits are peeler crab, squid and fish. By mid May they start to venture offshore to feed on the small fish that shoal up at these venues and you will catch the odd one here and there but usually the eels are on your bait long before any of the skate have had a chance to. A word of caution though - at Eastchurch Gap the trawlers sometimes drop their nets very close to the shore and this can adversely affect your catch rate at this venue. At the other mentioned venues though, the ground is too shallow for the trawlers to work their nets. If you want to target the hard-fighting stingrays then Eastchurch Gap is the place to try for them from mid May until July. Once the skate run finishes the trawlers seem to leave this ground alone. The weather conditions greatly affect your catch rate so avoid hot, calm and still conditions. All the best recorded catches have been when the weather was mild but overcast with low pressure showing on the barometer. They are often caught on the first of the flood tide but the best catches have come from between 1 to 3 hours into the ebb. The preferred baits are crab, fish and squid. The venues to try for smooth-hounds are Warden Point and the Boom at Minster and the preferred baits are crab, fish and squid. From July until early September smooth-hounds can be caught no matter what the weather conditions, particularly by anglers who can cast 80 yards plus. All of the above-mentioned venues are superb marks if you like to fish for the eels and bass.